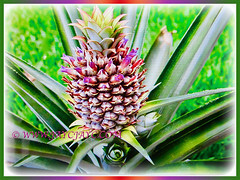 Pineapple is a shallow-rooted tropical plant that produces showy flowers and edible fruits. It is one of the most popular fruits in the world and grown commercially for their excellent fruits. Besides, they are grown ornamentally as landscape plants. Botanical Name: Ananas comosus (syn. : Ananas acostae, Ananas argentata, Ananas bracteatus, Bromelia ananas). Common Names: Pineapple, Nanas in Malay. Etymology: The genus name Ananas comes from the Tupi word nanas, meaning excellent fruit. The specific epithet comosus meaning tufted with reference to the flowers and fruit produced in a tuft above the foliage. Origin: Native to southern Brazil and Paraguay. Plant type: An ornamental fruit-bearing shrub. 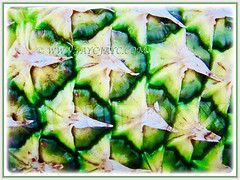 Features: Ananas comosus is from the genus Ananas that consists of 9 accepted species. A herbaceous and tropical perennial that grows between 0.5-1.5 m tall, although sometimes it can be taller. The plant has a short and stocky stem with a rosette of waxy sessile leaves. The sword-shaped leaves that are arranged in a rosette are rigid with a spiny leaf margin and a grooved upper surface. 30 or more long leaves, measuring between 30-100 cm in length, surround a thick stem. Leaves may be all green or variously striped with red, yellow or ivory down the middle or near the margins. Eventually, the stem grows into a spike-like and sessile inflorescence up to 15 cm long with about 50 to 100 spirally arranged, trimerous flowers, each subtended by a bract. Each bisexual flower consists of 3 sepals and petals which encloses 6 stamens and a 3-branched stigma. The showy flower colours vary, depending on variety, from purple to red. 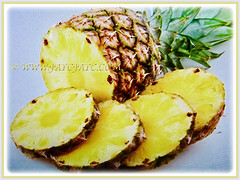 The cylindrical-shaped pineapple is an aggregate fruit formed by the fusing of the individual fruits. The tough and waxy rind is made up of hexagonal units that may be dark-green, yellow, orange-yellow or reddish when the fruit is ripe. Mature fruits up to 30 cm long and weighing up to 6 kg are coloured orange, yellow or golden. After the first fruit is produced, side shoots called suckers are produced in the leaf axils of the main stem. These may be removed for propagation or left to produce additional fruits on the original plant. Seed formation needs pollination but the presence of seeds harms the quality of the fruit. 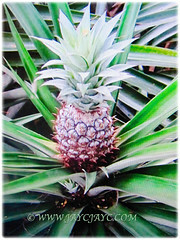 Culture (Care): Ananas comosus or Pineapple can be grown easily with least maintenance. Soil: Humus-enriched, sandy loam and well-drained soils. Tolerant to acidic and drought soils. It is essential to have good drainage to prevent root rot. 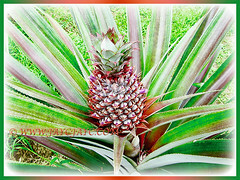 Ananas comosus or Pineapple is a tropical or near tropical plant that produces edible fruits. A temperature range of 18.33-45°C is most favourable, though the plant can tolerate cool nights for short periods. Prolonged cold retards growth, delays maturity and causes the fruit to be more acidic. It is best cultivated under full sun at temperatures of 23-32°C. Pineapple can be grown outdoors in frost free areas where temps typically range from 18-35°C. 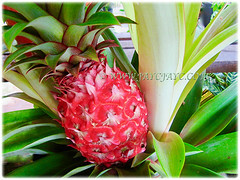 In temperate regions, pineapples are grown indoors in warm greenhouses or in containers as houseplants. Containers may be taken outside in summer and placed in full sun locations but should be brought back indoors when night temperatures begin to dip below 15°C. Indoor plants require a consistently moist soil, bright sun, high humidity and an air temperature that does not dip below 18°C. Fruits may not appear on indoor plants during the first few years. Indoor fruits are ornamentally attractive but normally quite small and not tasty. Propagation: It can be propagated by crowns which is the leafy clumps on top of mature fruits, slips on peduncles below the fruit and suckers along the stem. 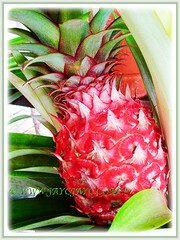 Usage: Ananas comosus or Pineapple will be excellent if home-grown to supply your family with pesticide-free fruits. It is suited for container gardening or grown in the ground. It’s fruit can be consumed fresh, cooked or preserved. Pineapple’s sweet juice can be served as a cool drink to quench one’s thirst on a hot day. 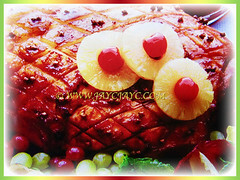 Chunks of pineapple are used in desserts, cakes, pineapple tarts and in some savory dishes including pizza toppings. 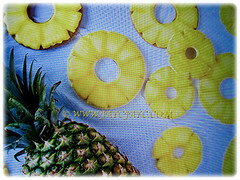 Crushed pineapple is used in yogurt, marmalade jam, sweets, ice-cream and as crystallized fruits. 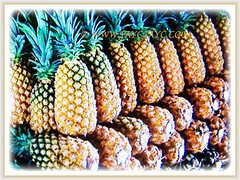 Fruits of pineapple and sometimes together with other cocktail fruits are canned. In addition to consumption, the pineapple leaves are used to produce textile fiber in Philippines which are commonly used as material for the men’s and women’s garments. The fiber is also used as a component for wallpaper and other furnishings.